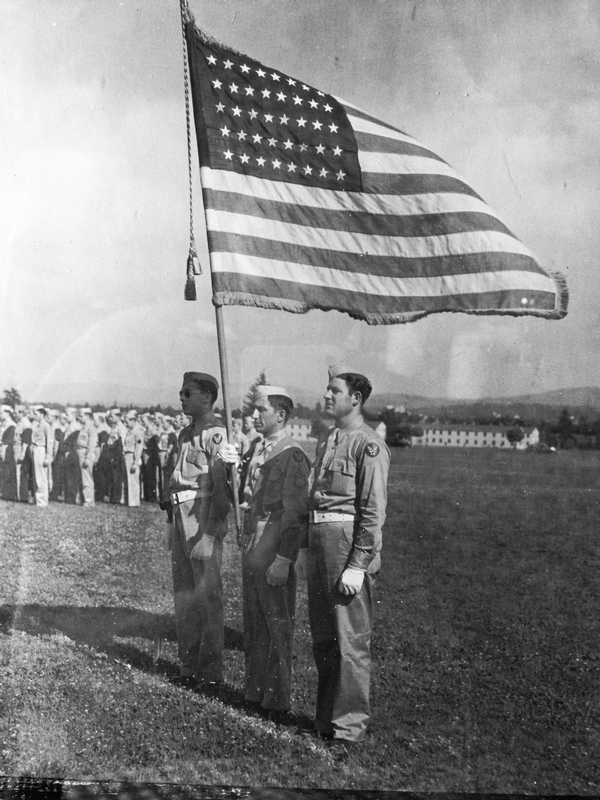 My grandfather holding the flag at the very first Flag Day. An Italian immigrant, he loved being an American. I do not usually talk about politics, but I find myself in a precarious position today. Many issues we face as humans have somehow become political, when they are ethical, personal, or simply in regard to human survival. I believe these issues are; the arts, the environment, education, and health. We as a society seem to have lost the ability to discuss these particular topics, without a party slogan, and without thinking that there are only two sides to every issue – Conservative or Liberal, Republican or Democrat. My feelings on human issues that have been politicized deepened today when an article dropped in my news box about the new open carry law in Georgia. Though I am a pacifist, I have remained respectful that others do not see the world the same way I do, understanding that guns to some are essential to their way of life. I do not understand why the freedom to own was not enough and that we must have the freedom to be battle-ready at all times, in any place. I feel this new law leaves the political arena, and imposes itself on the health and well-being of others (health being one of the issues I feel is a human issue). My fear of co-existing in a state I have called home for 37 years has increased exponentially with this law, filling me with anxiety. After a 10 year hiatus, I even experienced a night terror this week. This feeling about the new gun law poked at my thoughts and feelings on the other issues that have been politicized. Issues that have been tortured in the political arena, to the point that the issue itself is obscured by a party stance. It made me think about how politicization has perhaps suffocated the arts (especially in education), turned schools into testing labs, allowed us to blatantly pollute our world, and further restricted healthcare to poor Americans just to express ones opposition of the Affordable Healthcare Act. While many people are stepping onto the shores of anarchy, I ask: What is it you wish to accomplish? Are we really fighting to defend a way of life that allows all citizens to be created equal? Are we making history of which future generations will be proud? Are we loving our neighbor? It is in this moment that my autism stands like a stark, cold edifice in the center of my mind. I get overrun with feelings that conflict with my logic – How is it I can love humanity so deeply while simultaneously being highly annoyed by people? I cannot understand why society spends millions upon millions of dollars searching for a way to cure me, labeling me as lacking empathy, while they who cast this upon the ASD population are drowning in their own opposition to anything that does not benefit only them. Is that not the very definition of apathy? The world whispers to me in beautiful waves of sound. The music of the human soul, and the music of the earth’s soul in harmonious counterpoint, express an amazing love for one another. But people are growing increasingly deaf to this musical dance in exchange for the cacophony of human discord. And to what end? What we create here on earth we cannot take with us beyond the grave, so why only serve ourselves? Besides, the only thing we can really do for ourselves is create memories of us in the minds of others. We cannot control our death. All else we do is for others – for humans, for animals, for trees, all life in and beyond our immediate scope – doing for them by way of generosity, love, and the types of innovation that leave a better world than was left by our ancestors. Perhaps I am being over analytical, and I do realize that my honesty here has made me a target for a lashing by those who oppose what I value. I suppose I will have to just accept that. I will keep my autism and carry it with me forever, as I would rather live this life misunderstood and tyrannized, than to waste my life pursuing an illusory need to be justified. I will sing. I will dance. I will love others. I just won’t be so quiet about it anymore.